This entry was posted in Recent Posts and tagged Death, Faith, Family, God, Heaven, Jesus, Letting Go, Life, Love, Loved ones, Mothers, Passing Over, Photography, Poetry, sons. Bookmark the permalink. May you find peace in the memories of the one you love, whose spirit is still with you. Wow. Tell Leah that is just awesome. I’m amazed, actually. Wowawee! I’ll tell her. We were all pretty well blown away by it, as well. So cool!! Every time I look at it…wow. 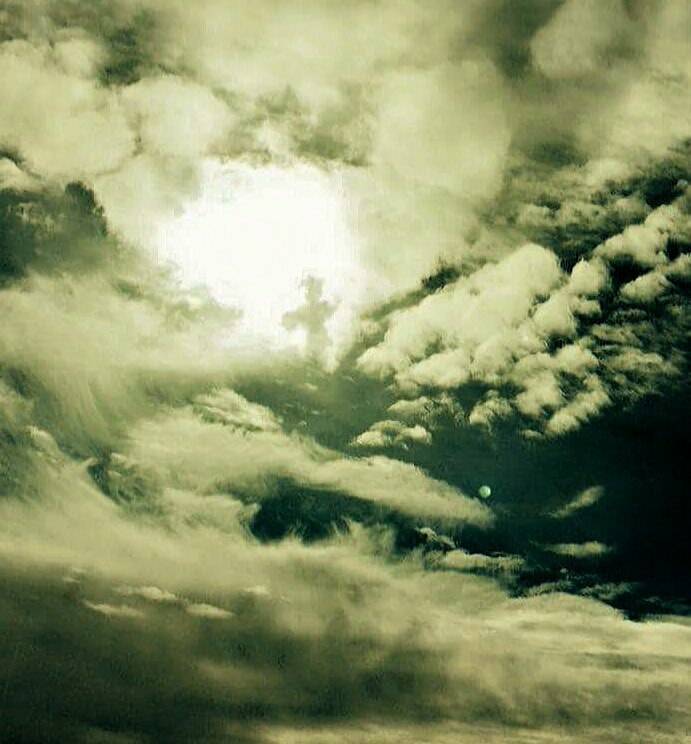 Not only did I see the cross, but right above it, there’s a star of sorts. See it? Lovely photo and poem, but I’m sorry they were prompted by such sadness. Hugs to both of you! So glad you saw the beauty in this, Debbie. Thanks for the sweet comment. Hugs! Enjoy your week! I noticed the cross right off. Lovely words. Hang in there, Audrey – my thoughts are with you as you go through hard times. Oh wow, how about that. Great photo your sis took Audrey. A beautiful partnership between the two of you with the photo and the poem. But, who are you guys saying goodbye to? Thank you, my friend. We said goodbye to her five year old son 13 years ago this week. And currently we have a family member passing. Hugs! The cross was what I saw first. It is a fantastic photo! I loved knowing she received such a special reminder. All I can say to describe this is, that was beautiful. Quite simply, beautiful. That’s a special photo. You matched it very well. Thank you, Dan. I was hoping to bring encouragement to a rough process. Beautiful words to accompany that beautiful photo! She was pretty excited about catching this photo. I’ll pass on your encouraging comment. ♡ Thank you! She did a great job.. You can even see the moon.